Around one in five Australians will experience Irritable Bowel Syndrome (IBS) during their lifetime. IBS can cause a great deal of distress and discomfort and have a significant impact on quality of life; however, it does not cause permanent harm to the bowel or increase the risk of developing cancer or colitis. Since IBS does not cause permanent damage the treatment is focused on symptom management and improvement in quality of life. The low FODMAP diet has been proven to help up to 80% of people who suffer IBS. 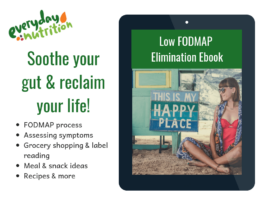 But what happens if you are following the low FODMAP diet and still experiencing symptoms? Before you give up here are 5 key things to consider when forming your personalised management plan. Stress is a significant trigger for IBS, and if you are stressed it may not be food that is causing your symptoms. It is worth incorporating some stress management techniques into your routine, such as light exercise, yoga, meditation or mindfulness. There are a variety of techniques so find one that is right for you. Speed of eating, talking while eating, chewing gum and fizzy drinks can cause you to swallow excess air which can increase IBS symptoms. Eating slowly, in a relaxed environment, chewing food thoroughly and avoiding chewing gum & fizzy drinks has been proven to reduce IBS symptoms. Meal size can trigger an IBS attack. Smaller more frequent meals are gentler on the stomach. Further, some low FODMAP foods become high FODMAP when eaten in large portions. Fibre is vital for health and function of the digestive system. It helps things pass through the gut at a desirable speed decreasing the likelihood of constipation. It also adds bulk, improving consistency and reducing diarrhoea. It can be difficult getting enough fibre on a low FODMAP diet, adding extra fibre to meals or a supplement may help. When increasing fibre, it is also important to increase fluid at the same time. These are all gut irritants and exacerbate IBS symptoms. If your symptoms are on going, be wary of spicy foods and limit caffeine and alcohol. Not smoking at all will lessen IBS symptoms, and has the added benefit of helping you and those close to you breathe easier. The low FODMAP diet is a learning curve and tolerance does vary from person to person and also over a person’s life span. 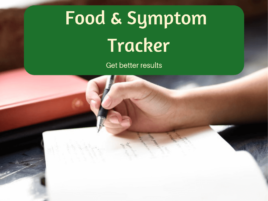 Keeping a food, lifestyle and symptom diary can help in identifying triggers. Seeing an accredited practising dietitian who has a special interest in IBS is a worthwhile investment, an APD can help develop an individualised plan that minimizes symptoms and optimises quality of life.